The Meadows Center for Water and the Environment, formerly Aquarena Springs and later the Aquarena Center, is an educational center in San Marcos, Texas, dedicated to the preservation of the unique archeological and biological resources of Spring Lake. Visitors can take glass-bottomed boat tours of Spring Lake and view live native animals and fish in the Discovery Center. The function of the Meadows Center for Water and the Environment is to develop and promote programs and techniques for ensuring sustainable water resources for human needs, ecosystem health, and economic development. At Texas State University-San Marcos, the Meadows Center serves as an integrating mechanism for the university’s multidisciplinary departments that are involved with aquatic resources. Texas State is home to several departments and research centers engaged in critical scholarly work on water management issues. The Meadows Center at Spring Lake Hall houses the Texas Stream Team, a volunteer program that monitors the water quality of freshwater systems through the state. Aquarena Center was established in 1994 when Southwest Texas State University purchased land previously used as an amusement park, including Spring Lake, an artificial freshwater reservoir which contains several of the San Marcos Springs. The San Marcos Springs are the headwaters of the San Marcos River. 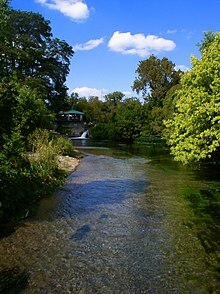 The site contains more than 200 springs with water from the Edwards Aquifer and that discharge an average of 123 million US gallons (470,000 m3) of water daily, is one of the oldest continuously inhabited places in North America. Artifacts discovered in digs conducted from 1979 to 1982 date back 12,000 years. The first Europeans to visit the springs were probably Spanish explorers in 1689. The springs were an important stop on the Old San Antonio Road and the Chisholm Trail. In 1847, former Republic of Texas vice president Edward Burleson purchased the land surrounding the headwaters of the river and built a cabin on the hill overlooking the headwaters. Two years later Burleson built a dam just below the springs to power a mill. This dam, which created Spring Lake, still exists today. A.B. 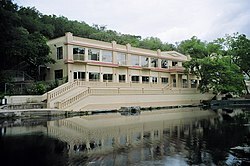 Rogers purchased the property in 1926 and his son, Paul, developed a hotel there in 1928 and introduced glass bottom boats to the lake. Spring Lake has been visited by notable individuals including Robert E. Lee, Jay Gould, and Helen Miller Shepard. In the 1950s, construction of a submarine theater and large spillway at one end of the lake to produce a swimming pool led to the opening of Aquarena Springs, an amusement park, at the site in 1951. Other features of the park were the Alpine Swiss Sky Ride (a Von Roll skyride), an Intamin 220 foot Sky Spiral that moved vertically above the lake and rotated 360°, and "Ralph, the Famous Swimming Pig" and "mermaid" performers that could be viewed from the submarine theater. The park also included a coin-operated arcade in which human visitors would "compete" in games like Tic-tac-toe against chickens, whose "moves" in the game were determined by pecking lights which appeared only on the chicken's side of the machine. At its peak, Aquarena Springs attracted 250,000 visitors annually. The center added a Wetlands Boardwalk in a shallow area of Spring Lake. The boardwalk, made of recycled plastic lumber, floats on the water and circles a marshy area that showcases the flora and fauna of a wetland ecosystem. Aquarena Center was designated as a "critical habitat," subject to the Endangered Species Act, because the springs are home to the fountain darter, the Texas Blind Salamander, the San Marcos Salamander, the San Marcos gambusia, and Texas Wild Rice. The San Marcos gambusia may be extinct as none have been seen since 1983. The main aim of the center is research. The MCWE participates in underwater archaeology. It searches for Henry Morgan’s lost fleet while exploring caves in Mexico, Spring Lake, and shipwrecks. The center uses unmanned aircraft (Unmanned Autonomous Vehicle) to capture photos and gather information for projects related to fisheries, wildlife, and watershed management and restoration. The Meadows Center is dedicated to the sustainable management of the world’s freshwater resources. They oversee the Spring Lake Management Plan, which is designed to protect healthy ecosystems, provide research and educational opportunities, and offer access for service activities. As active partners in the Edwards Aquifer Habitat Conservation Plan, they help ensure minimum continuous spring flows of the Comal and San Marcos Springs. The Aquarena Springs Amusement Park was the actual location of the resort in the 1978 film Piranha, directed by Joe Dante. ^ Finty, Tom; Editorial Staff (1904). Texas Almanac and State Industrial Guide. Harvard University: Belo & Company. pp. 286–287. ^ "Mermaid Theater." Popular Mechanics, June 1952, pp. 71-73. "What is Aquarena Center". Texas State University San Marcos Aquarena Center. Retrieved Jul. 28, 2005. "Aquarena Springs". TexasEscapes.com. Retrieved Jul. 28, 2005. "San Marcos Springs". The Edwards Aquifer Homepage. Retrieved Jul. 28, 2005. Wikimedia Commons has media related to The Meadows Center for Water and the Environment. This page was last edited on 31 July 2018, at 23:08 (UTC).